On the cover: Our favorite symbol in the whole wide world. And our cheapest design yet! The absurdly high real estate prices of the Bubble Economy are ancient history. Today's boom is more selective, primarily benefitting the IT-compatible properties favored by New Economy players. There's not much of it in Japan, but recent developments could lead to terrific profits ... for those in the know. The Internet's original killer app is still the best tool for reaching the world's second-largest online population. Bit Valley has already been accused of over-hyping itself. Now it looks like it underpays, too. Say hello to JANBO, whose job it is to foster incubators that will in turn foster startups. 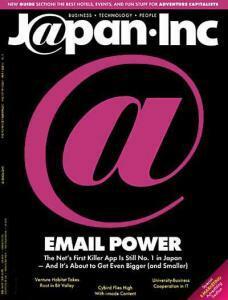 A New Entrepreneur Mag ... in Japan? One way to get a feel for Japan is to check out what's new on the magazine racks. MyBiz targets wannabe entrepreneurs. Is it a sign? How's this for a domain name: Now it's possible with a new service. But is it necessary? The former editor in chief of Wired Japan levels some valid criticisms against Bit Valley. Then again, with his new magazine Cyzo, he's criticizing ust about everything in Japan. Somebody has to do it. He's back! Allen Miner, that is, ex-head of Oracle Japan and one of the best-known Japan technology hands. After a four-year break in Silicon Valley during which he finished up his Oracle stint and moved on to found SunBridge, a respected venture catalyst, Miner has returned to Tokyo to establish SunBridge's Venture Habitat, a 20,000-square-foot incubation facility that aims to foster new Internet life in Bit Valley. She's from Japan, but her venture Onna.com is based in the US. When her home-country VCs turned her down (and off), she turned to VCs in ... Israel? It worked. This is one ambitious teenager. At the age of 18 he's already president of the Shotengai Network, a consortium of some 40 online "shopping streets." One thing that many Net ventures in the US are not good at is globalization. I think a federation of companies helping to globalize is necessary. I've talked myself blue in the face trying to convince foreign VCs to locate themselves in Shibuya. Venture Habitat has the right idea. There's a glut of venture money here, but a scarcity of talent. After creative bilingual Japanese, risk-taking gaijin are the No.2 target of headhunters. On the Japanese longing to get entrepreneurial, keitai manners, and things that make online shoppers trust a Web site. A look at Japanese color preferences and perceptions -- useful for anyone who markets anything in this country. When it comes to Internet content for the cell phone, Cybird is the early bird that got the worm. Now it's flying high. Internet Stocks -- When Is the Nijikai? Japan's tech stocks have been through a much-needed correction. Is it time for the nijikai, the post-party party? Here's a fresh overview of the Net stock scene. A convenient mix of art and advertising. Egads! The Japanese are porking out. Fat of the land. In the two decades spanning 1979 and 1998, Japanese males in all age groups became considerably porkier. Indeed, more than 25 percent of those between 20 and 70 are regarded as obese (by the Ministry of Health & Welfare's definition thereof), with those in the 30 to 40 bracket exceeding 30 percent. For women, particularly those in their teens and twenties, the skeletal look is in. More than 20 percent in these segments are regarded as underweight.